Last fall I read Eleanor & Park by Rainbow Rowell. I adored it. I couldn’t talk it up enough in my classroom, and for the rest of the school year there was a wait list for it. I meant to read Fangirl next, but due to the popularity of Eleanor & Park, it was also checked out all year, so I moved on to other books and other authors. 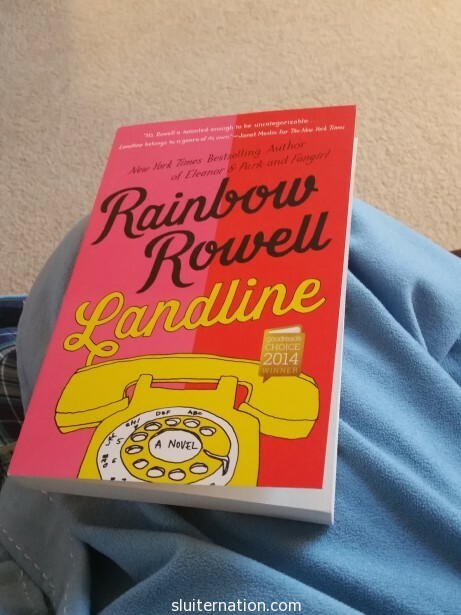 This summer I was perusing the “new in paperback” section at the book store and saw Landline. I picked it up even though I had a pile at home of other books to read. I will admit the premise of a telephone that calls the past was weird, but I trusted Rowell. I knew if anyone could make it work in a quirky, witty way, it was her. And I was not disappointed. Georgie McCool is a writer for a TV comedy series with her best friend since college, Seth. She spends a ridiculous amount of time at work, leaving her husband, Neal, home with their two small daughters. Georgie and Neal love each other, but there is always a tension. It comes to a head when Georgie chooses to spend their Christmas vacation home working with Seth rather than travel Omaha with her family. Over the time her family is gone, Georgie discovers that the phone in her childhood bedroom at her mom’s house can call Neal–not present-day Neal–but Neal from when they were in college. Her phone is like a time machine. Now she has to figure out how to make things right with him by talking to the past. I don’t tend to pick up a book if I think it might be a sappy love story. This is not a sappy love story. It is funny and ridiculous and a little sad in places, but not sappy. Rowell tells the story from Georgie’s point of view. It bounces back and forth from present-day to her memories of meeting and dating Neal when they were in college, when they were first engaged and married, and to when their daughters were born. Rowell’s characters and dialogue quick and spot-on. She even manages to make me a bit nostalgic for the 90’s. I think I even liked this book more than I liked Eleanor & Park. And that is saying a LOT because I gushed about that book. Want to contribute to my classroom library? Check out my students’ Wish List! Links are affiliate with Amazon. Anything purchased via those links will give me Amazon credit toward books for my classroom. I thoroughly enjoyed Landline too. So much so, I finished it in 2 days!